A pragmatic philosophy more popular than ever—here are fifty-two ancient lessons to help you overcome adversity and find tranquility in the modern world. 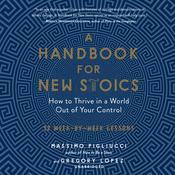 An ancient belief system made new, Stoicism teaches us how to accept the things we cannot change and how to live a good life. It helps us improve our outlook, increase our well-being, and thrive in the face of adversity. 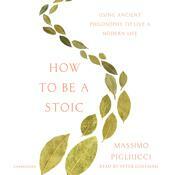 But how does one live like a Stoic? 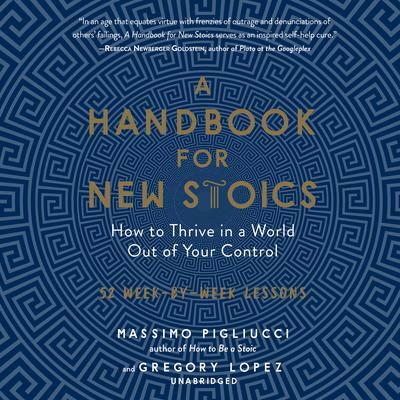 In A Handbook for New Stoics, renowned philosopher Massimo Pigliucci and practitioner Gregory Lopez guide listeners through fifty-two weekly lessons, each based on a common obstacle. Stressing out about a meeting at work? Try listing the things you can control and those you can’t. Epictetus writes: “In our power are thought, impulse, will to get, and will to avoid”—in other words, our own attitudes. Discover what you can control and quickly achieve peace of mind. Massimo Pigliucci is the K. D. Irani Professor of Philosophy at the City College of New York. He holds PhDs in genetics, evolutionary biology, and philosophy. Pigliucci has written for many outlets, including the New York Times, and has written or edited ten books. He lives in New York, New York. Gregory Lopez is the founder of the New York City Stoics Meetup and cofounder of the Stoic Fellowship. He lives in New York City.